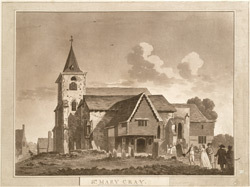 A printed view of St Marys Cray Church in Kent. This church dates mostly from the 13th century. It has a west tower with shingled spire, nave and aisles. The settlement of St Mary's Cray was originally called South Cray because it was the southern most settlement on the River Cray. It was later named after St Mary to whom this church was dedicated.